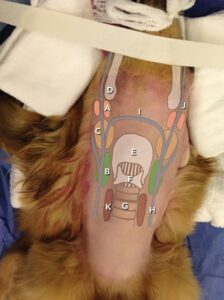 In the field of veterinary oncology, lymphadenectomy can play an important role in our veterinary patients with regard to clinical staging, determining prognosis, developing treatment plans, and decreasing tumor burden. Techniques for surgical excision of peripheral lymph nodes are infrequently described in the literature. The goal of this article is to describe the location and anatomy of commonly removed peripheral lymph nodes and illustrate effective strategies for surgical excision of these nodes. The lymph node is the structural and functional unit of the lymphatic system. Lymph nodes act as a filter of lymph, as well as a germinal center for lymphocytes. Lymph nodes are typically firm, smooth, and ovoid or bean-shaped. They contain a poorly defined cortex and medulla, and have a concave hilus region, which contains efferent lymphatics and blood vessels. Lymph flows from lymph capillaries via the afferent lymph vessels to the regional lymph node, and efferent lymph vessels leave the lymph node, carrying lymph that is filtered and enriched with lymphocytes. Groups of neighboring lymph nodes that occur in the same region of the body and receive afferent vessels from approximately the same region, in most species, are known as lymphocentrums or lymphocenters. Within a lymph node, metastatic lesions may be focal and missed by cytology. If metastasis is suspected clinically, but cytology is negative for neoplastic cells, histopathology is warranted to ensure the cytology sample is representative of the entire lymph node. In addition, for head and neck lesions, the sensitivity of cytology is only reported for mandibular lymph nodes. Access to the retropharyngeal lymph nodes for aspiration can be challenging and typically requires ultrasound guidance, which may be a limitation of this technique. Mixed cell responses are often hard to interpret, as some cells do not readily exfoliate and, in some cases, reactive hyperplasia can mimic neoplasia. We rarely perform needle core or incisional biopsies unless the lymph node is significantly enlarged, due to the relative ease of excisional biopsy. If a needle core or incisional biopsy is performed, prolonged direct pressure to the lymph node or closure of the capsule may be required to address any hemorrhage that occurs. When possible, excisional lymph node biopsy is considered the preferred method to determine if metastatic disease is present. Excisional lymph node biopsy is also warranted in patients with metastatic neoplasia in which lymph node biopsy is not only useful for diagnosis, but also to decrease tumor burden prior to adjunctive therapy. FIGURE 1. Illustration of the pertinent regional anatomy of the neck. The mandibular lymph nodes are the easiest to palpate and, subsequently, the easiest to surgically remove. In dogs and cats, the medial retropharyngeal lymph node group serves as the collecting center for the head, receiving drainage from the lateral retropharyngeal, parotid, and mandibular nodes. Based on lymphatic drain patterns, the medial retropharyngeal lymph node may yield the most information regarding regional metastasis of oral neoplasms.7 However, these lymph nodes cannot be palpated when normal in size and are one of the most challenging types of lymph nodes to identify surgically. In the neck, commonly, only the superficial cervical lymph nodes are excised, as the deep cervical lymph nodes are deeply located, variable in number and position, small in size, and require a much more extensive dissection for removal. 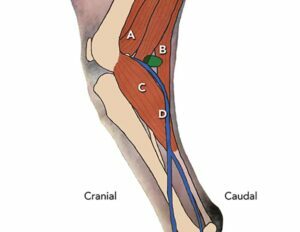 The popliteal lymph node is easily located caudal and distal to the stifle. This lymph center is typically present as a single node and it is the easiest lymph node to sample when peripheral lymphadenopathy is present. Techniques for removal include sharp or blunt dissection or careful electrocautery, aiming to stay immediately outside the lymph node capsule (Figure 2). Cotton tip applicators (ie, cotton swabs) can be used to perform blunt dissection of small or more delicate lymph nodes. Maintaining a grip on the lymph node to be removed is recommended to avoid losing its location. To maintain a tight hold on the desired lymph node and aid in dissection, the perinodal tissue can be carefully grasped with thumb forceps, Allis tissue forceps, or a stay suture placed through the node, depending on the size and fragility of the node. Care must be taken to avoid crush artifact of the lymph node. Ligation of the lymph node’s blood supply, provided via the vascular hilus, can be achieved using absorbable monofilament suture (ie, 4-0 or 3-0 PDS, depending on size) or with electrocautery. FIGURE 2. Extirpation of the lymph node is accomplished with a combination of blunt and sharp dissection (A). The lymph node is grasped with fingers or the perinodal tissue to prevent damage, as it can be very friable (B). Electrocautery, if available, can be useful for dissection and coagulation of small vessels and the vascular bundle (C). FIGURE 3. Position of the mandibular (A) and medial retropharyngeal (B) lymph nodes relative to the anatomy of the neck, mandibular salivary gland (C), caudal extent of the mandible (D), thyroid cartilage (E), cricoid cartilage (F), trachea (G), external jugular vein (H), hyoid venous arch (I), facial vein (J), and thyroid gland (K). The dorsal mandibular lymph node is typically flattened, 3-sided, and approximately 10 mm long in the dog. The ventral mandibular lymph node is typically long and ovoid, approximately 10 mm wide by 20 mm long, and flattened transversely. Dorsal recumbency for bilateral removal (see Patient Positioning, Medial Retropharyngeal Lymph Node Center). If bilateral lymphadenectomy of the mandibular and retropharyngeal lymph nodes is desired, the midline ventral cervical technique is recommended (see Surgical Technique, Medial Retropharyngeal Lymph Node Center). 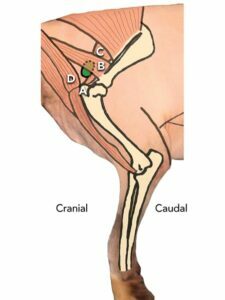 Palpate the freely mobile mandibular lymph node just caudal to the caudal angle of the mandible. While digitally grasping the desired lymph node, make an incision parallel with the angle of the mandible, directly over the node (Figure 4). Continue the incision through the subcutaneous tissue until the superficially located lymph node is encountered. Be cautious with dissection as the facial vein lies directly beneath this node and can be inadvertently lacerated. Grasp the node atraumatically with thumb forceps or Allis tissue forceps, or use a stay suture; dissect it free from surrounding tissue. Repeat this procedure, if needed, on the contralateral side. Close the subcutaneous tissues in a single layer interrupted or continuous closure, with 3-0 or 4-0 monofilament absorbable suture. Close the skin in interrupted cruciate pattern. FIGURE 4. Incision for single mandibular lymph node removal. This approach can be performed bilaterally but only is recommended for access and excision of the mandibular lymph nodes. More deeply located than the mandibular lymph nodes, but still within the deep subcutaneous tissue and external pharyngeal fascia layer. These lymph nodes are the largest nodes in the head and neck. The most prominent node in the group is elongated, transversely compressed, and approximately 50 mm long by 20 mm wide (Figure 5). Do not confuse them with the thyroid gland, which is closer to midline, medial to the carotid artery and caudal to the thyroid cartilage. The thyroid gland is also generally smaller with a more distinct blood supply. FIGURE 5. Removal of retropharyngeal lymph node (A); note the typical tubular or elongated shape (B) of this normal lymph node. Normal medial retropharyngeal lymph nodes cannot be palpated externally. In addition, important structures located in the neck can be damaged with extensive and unnecessary dissection, including the recurrent laryngeal nerve, vagosympathetic trunk, carotid artery, and jugular vein. For unilateral removal of a medial retropharyngeal lymph node, a lateralized or ventral midline incision can be performed. Concurrent unilateral removal of the parotid, submandibular, and retropharyngeal lymph nodes has also been described,3 although the parotid lymph nodes are generally considered low yield with regard to staging and, in our institution, are not excised unless overtly abnormal. Regardless of the technique selected, identification of a normal-sized retropharyngeal lymph node can be challenging and good anatomical knowledge is essential for efficient and safe removal. Position the patient in dorsal recumbency with a rolled towel under the neck (Figure 6). FIGURE 6. Patient positioning for access to bilateral mandibular ± retropharyngeal lymph nodes. A rolled towel can be placed under the neck to aid in providing a flat working surface. The area for hair removal in this image is based on a midline approach and would need to be more lateral for the lateralized approach. The dotted line represents the location of the incision. This approach is not commonly performed but can be used unilaterally or bilaterally for removal of the medial retropharyngeal lymph nodes. The mandibular lymph nodes can also be removed, as described earlier, from this approach. 1. Palpate the mandibular salivary gland and mandibular lymph nodes caudal to the angular process of the mandible. 2. Make an approximately 3- to 5-cm incision, starting just cranial to the mandibular salivary gland, in a craniolateral to caudomedial direction. This incision can be extended in either direction as necessary. 3. Continue the skin incision through the superficial subcutaneous tissue layer. Small vessels encountered can be cauterized with electrocoagulation or grasped with mosquito forceps to minimize bleeding. 4. Use Gelpi retractors for skin retraction and to help improve visualization of the deeper structures. 5. Identify the mandibular salivary gland and retract laterally. 6. Identify the medial retropharyngeal lymph node. The cranial border of the lymph node is often medial and caudal to the caudal pole of the salivary gland, and medial to the linguofacial vein (not always seen) when approached using this technique. 7. Carefully dissect the lymph node free with blunt dissection, staying close to the capsule and taking care to not extend the dissection too medially. 8. Ligate or cauterize the vessels located at the hilus and remove the lymph node. 9. Close the subcutaneous tissues in a single or double layer subcutaneous closure (depending on dead space) with 3-0 or 4-0 monofilament absorbable suture. 10. Close the skin in an interrupted cruciate or Ford interlocking pattern. 1. Identify the angular process of one side of the mandible and palpate the ipsilateral mandibular lymph nodes externally just ventral and caudal to this location. Do not mistakenly identify the mandibular salivary gland, which lies just caudal and dorsal to the lymph nodes, as a lymph node. 2. Perform a ventral cervical midline incision that extends from just cranial to the angular process of the mandibles to the cranial aspect of the larynx (thyroid cartilage). 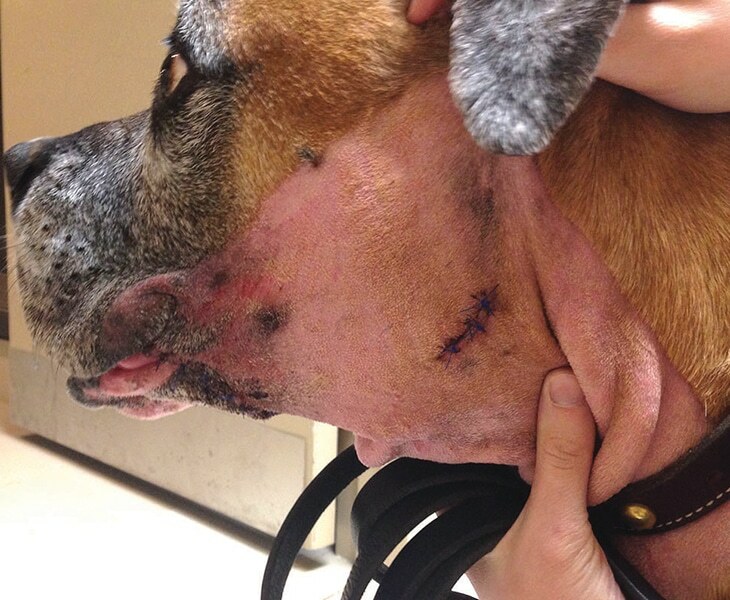 This skin incision location is essential—do not make the approach too caudal. 3. 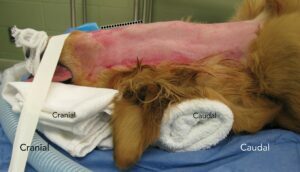 Continue the skin incision through the superficial subcutaneous tissue layer, taking care not to dissect too deeply. Small vessels encountered can be cauterized with electrocoagulation or grasped with mosquito forceps to minimize bleeding. 4. Use Gelpi retractors to help improve visualization of lymph nodes. 5. Approach the mandibular lymph nodes first, identifying the mandibular salivary gland and linguofacial bifurcation. 6. Gently dissect the superficial subcutaneous tissue layer with blunt dissection until the ventral mandibular lymph node is encountered, just ventral to the facial vein. 7. Once identified, dissect the ventral mandibular lymph node free from surrounding tissue, staying close to the lymph node capsule. Ligate or cauterize the vessels located at the hilus and remove the lymph node. 8. Repeat the procedure on the contralateral side through the same incision to remove the contralateral lymph node. 9. Use the hyoid venous arch (Figure 3) as a landmark for orientation—the retropharyngeal lymph node is located caudal to this often-prominent vessel and at the level of the cricoid cartilage. 10. Identify the lymph node medial, dorsal, and slightly caudal to the easily palpable mandibular salivary gland, parallel to the linguofacial vein, and just caudal and medial to the linguofacial bifurcation. 11. Retract the salivary gland laterally and cranially and retract the sternocephalicus muscle laterally. Remove the medial retropharyngeal lymph nodes as described above. 12. Once the mandibular and retropharyngeal lymph nodes are removed, two small spaces where previous lymph nodes existed can be observed (Figure 7). 13. Close the subcutaneous tissues in a single or double layer subcutaneous closure (depending on dead space) with 3-0 or 4-0 monofilament absorbable suture. 14. Close the skin in an interrupted cruciate or Ford interlocking pattern. FIGURE 7. Appearance of the neck following removal of the mandibular (thin arrow) and retropharyngeal (wide arrow) lymph nodes on one side. The skin incision has been pulled laterally; note the linguofacial bifurcation (arrowhead). The salivary gland is also located dorsal to the bifurcation in this image but is difficult to visualize. Located just cranial to the shoulder joint in the subcutaneous tissue, under the superficial muscles of the neck. FIGURE 8. Position of the superficial cervical lymph node relative to relevant local anatomy. The region is first identified by palpation of the point of shoulder (A). The lymph node is medial to the omotransversarius muscle (B), subscapularis muscle (C), and cleidocephalicus muscle (D). The lymph node is highlighted in green. The majority of these lymph nodes are oval in shape, somewhat flattened, and approximately 30 mm long by less than 10 mm thick. Position the patient in dorsal or dorsolateral recumbency, with the forelimb of the affected side pulled caudally (Figure 9). FIGURE 9. Patient positioned for extirpation of the superficial cervical lymph node (A) and subsequent incision (B). Drape the affected shoulder region into the surgical field. The affected limb can also be draped into the surgical field to assist with manipulation and positioning. First, palpate the lymph node(s) externally, if possible. This is one of the more difficult lymph nodes to identify if not enlarged. Palpate the point of shoulder, medial to scapula and rib cage. Make an approximately 3- to 5-cm incision just cranial to the shoulder, starting at the shoulder and extending cranially in the direction of the omotransversarius muscle. Locate the lymph node—which is just medial to the superficial neck muscle and omotransversarius (Figure 10) and supraspinatus muscles of the scapula—and excise it. Close the subcutaneous tissues in a single or double layer subcutaneous closure (depending on dead space) with 3-0 or 4-0 monofilament absorbable suture. Close the skin in an interrupted cruciate or Ford interlocking pattern. FIGURE 10. View of the omotransversarius muscle after the incision has been made in the patient from Figure 9. In this patient, the incision is quite large because the lymph node is very enlarged (as can be seen in Figure 9B). Consistent in position—located in the subcutaneous fat deposit between the medial border of the biceps femoris and medial border of the semitendinosus muscle where the muscles diverge from each other. Figure 11. Position of the popliteal lymph node relative to the relevant anatomy of the pelvic limb, including the semimembranosus muscle (A), semitendinosus muscle (B), gastrocnemius muscle (C), and lateral saphenous vein (D). The lymph node is highlighted in green. This oval-shaped lymph node is considered the largest lymph node of the pelvic limb and is approximately 20 mm long. Position the patient in dorsal or lateral recumbency, with the pelvic limb draped into the surgical field. Locate the dead space (popliteal fossa) between the hamstring muscles and biceps femoris muscle by palpating the stifle joint and drawing a straight line to the caudal aspect of the stifle. Palpate the lymph node and perform a proximodistal incision in the popliteal space over the lymph node (Figure 12). The lymph node is in a relatively superficial position and extensive or deep dissection should not be necessary to identify the node. The lymph node is often surrounded by fat and can be difficult to identify but should be the only round superficial structure in this region. Once identified, grasp the lymph node gently, bluntly dissect the fat to expose the underlying lymph node, and then excise routinely. Close the subcutaneous tissues in a single layer interrupted or continuous closure with 3-0 or 4-0 monofilament absorbable suture. Close the skin in an interrupted cruciate pattern. FIGURE 12. Popliteal lymph node removal (A) and closed incision (B). In this case, the lymph node is a normal size. Accidental removal of mandibular salivary glands during mandibular or medial retropharyngeal lymphadenectomy. Lymph node dissection may result in disruption of the normal drainage pattern of the lymph nodes that can cause an abnormal collection of lymphatic fluid (lymphedema), especially when both mandibular and medial retropharyngeal lymph nodes are removed. This is a transient condition, however, and not expected to be a chronic complication of lymphadenectomy. Ensure you have a thorough understanding of the regional anatomy. Remove only affected and necessary lymph nodes. Carefully dissect and gently handle tissue to minimize dead space and trauma to the tissue bed. Postoperatively, decrease any possible pressure to the head and neck (ie, neck collars), which may disrupt lymphatic flow. Apply warm packs to, and massage, suspected seromas to minimize swelling. Never drain seromas; draining allows fluid contamination and increases risk of infection. During dissection, do not mistake the salivary glands for lymph nodes. In our experience, in cases of dissection of large, abnormal lymph nodes and/or concurrent surgeries of the head and mouth, a short course of antibiotics (eg, first generation cephalosporins or amoxicillin/clavulanic acid) is recommended to decrease the risk of postoperative infection. Lymphadenectomy is an important technique for evaluating abnormal lymph nodes or staging evaluation of patients with neoplasia. 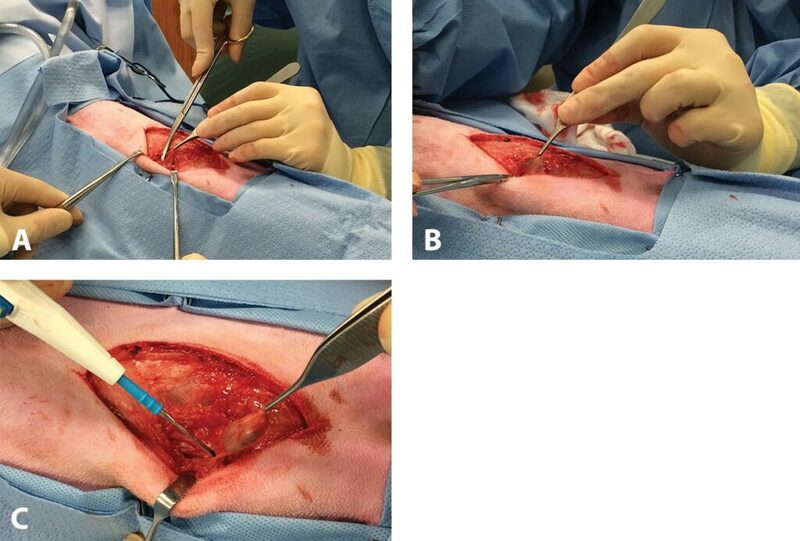 With a good understanding of local anatomy and lymphatic drainage patterns, peripheral lymph node extirpation can be straightforward and rewarding, providing valuable information for treatment recommendations and prognosis in these patients. Williams LE, Packer RA. Association between lymph node size and metastasis in dogs with oral malignant melanoma: 100 cases (1987–2001). JAVMA 2003; 222:1234–1236. Langenbach A, McManus PM, Hendrick MJ, et al. Sensitivity and specificity of methods of assessing the regional lymph nodes for evidence of metastasis in dogs and cats with solid tumors. JAVMA 2001; 218(9):1424-1428. Herring ES, Smith MM, Robertson JL. Lymph node staging of oral and maxillofacial neoplasms in 31 dogs and cats. J Vet Dent 2002; 19:122–126. Smith MM. Surgical approach for lymph node staging of oral and maxillofacial neoplasms in dogs. J Vet Dent 2002; 19(3):170-174. Tuohy JL, Milgram J, Worley DR, Dernell WS. A review of sentinel lymph node evaluation and the need for its incorporation into veterinary oncology. Vet Comp Oncol 2009; 7:81–91. Green K, Boston SE. Bilateral removal of the mandibular and medial retropharyngeal lymph nodes through a single ventral midline incision for staging of head and neck cancers in dogs: A description of surgical technique. Vet Comp Oncol 2015; Advance online publication. doi: 10.1111/vco.12154. Beltz GT, Heath TJ. Lymph pathways of the medial retropharyngeal lymph node in dogs. J Anatom 1995; 186:517-526. Tanya Wright, DVM, is a small animal surgical resident at Ontario Veterinary College (OVC), Canada. She is currently researching surgical methods for staging canine cancers and minimally invasive surgery options for osteosarcoma and splenic tumors. Dr. Wright received her DVM from Western College of Veterinary Medicine, Saskatchewan, Canada. She completed a rotating small animal internship at Atlantic Veterinary College, Prince Edward Island; a surgical internship at the Veterinary Emergency Clinic, Toronto; and a surgical oncology and soft tissue surgery internship at OVC prior to her residency. Michelle L. Oblak, DVM, DVSc, Diplomate ACVS (Small Animal), is an assistant professor of soft tissue and oncologic surgery at Ontario Veterinary College (OVC), Canada. Dr. Oblak has presented at national and international meetings and mentors veterinary students, interns, and residents. She has published a number of research articles and a book chapter. Dr. Oblak received her veterinary degree from OVC and then completed an ACVS Surgical Oncology Fellowship at University of Florida College of Veterinary Medicine. After reading this article, practitioners should be able to list the commonly sampled peripheral lymph nodes and identify many of these lymph nodes via palpation. 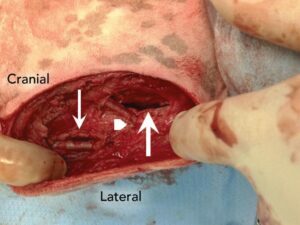 Readers should also be able to explain the general surgical approach for removal of each of these nodes and describe their anatomic locations. 1. What is the primary role of lymphadenectomy in patients with tumors? 2. 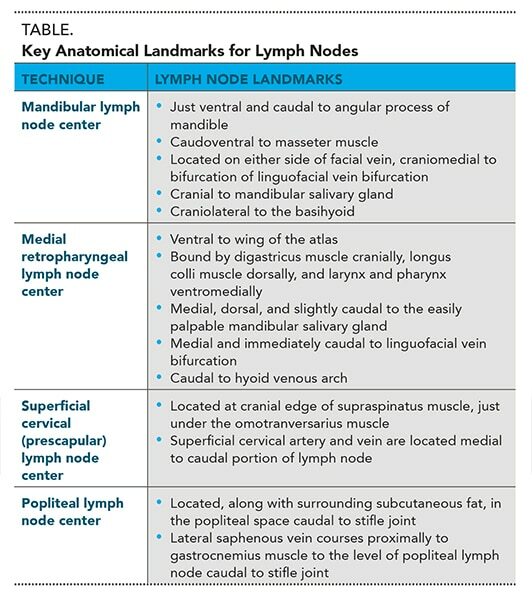 Which of the following is NOT a role of the lymph node? 3. Lymph node size is an accurate predictor of metastasis. 4. Which of the following is the most accurate test for determination of lymph node metastasis? 5. Which of the following peripheral lymph nodes is NOT a common biopsy site? 6. When removing unilateral mandibular lymph nodes, a ventral midline incision is most commonly used. 7. Which of the following lymph nodes CANNOT be palpated externally when normal? 8. Which of the following is not a landmark that can be palpated to determine where to position your ventral cervical incision? 9. Which of the following is INCORRECT regarding the popliteal lymph node? a. The popliteal lymph node center is found deep within the space between the biceps femoris and semitendinosus muscles. b. It is most frequently single but can occasionally be double. c. The lateral saphenous vein is a useful landmark for identification. d. It is located just caudal to the stifle joint. 10. Which of the following should NOT be performed to minimize complications? a. Minimize dead space and trauma with careful dissection and gentle tissue handling. b. Drain any seromas that form to prevent infection and accelerate healing. c. Avoid neck collars to decrease any potential disruption of lymphatic flow to the head and neck.